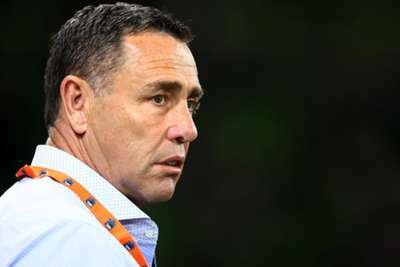 Cronulla coach Shane Flanagan is facing de-registration from the NRL and the governing body has proposed a fine of 800,000 Australian dollars for the Sharks. The NRL's integrity unit found Flanagan "continued to have dealings with the club" while he was suspended in 2014. Flanagan, 53, was then suspended for 12 months – with three months suspended – following the club's supplements scandal. The Sharks were fined 1million AUD – with 400,000 suspended – at the time. An investigation into the Sharks' salary cap found "Flanagan had dealings with the club in relation to recruitment and retention of players" during his suspension. The NRL proposed a fine of the initially suspended 400,000 AUD and an additional 400,000 AUD for Cronulla's latest breach. "In addition, Mr Flanagan has been issued with a notice of intention to cancel his registration," an NRL statement continued. "While the findings are preliminary and no final determination will be made until the response he provides has been properly considered, he will not be permitted to coach or act in any official capacity at the club pending a final determination. "Mr Flanagan and the club will be given until the end of January to respond." The Sharks accepted full responsibility but will appeal the fine, while offering wellbeing support to Flanagan. The #NRL has de-registered @Cronulla_Sharks coach Shane Flanagan and @WestsTigers chief executive Justin Pascoe over separate breaches. The Wests Tigers were also issued with a breach notice relating to an undisclosed agreement to pay Robbie Farah as an ambassador when he finishes his career. The NRL proposed a fine of 750,000 AUD for the Tigers and the value of the ambassador's agreement – 639,000 AUD – be added to their salary cap for 2019. "Further, the NRL has issued a notice of intention to cancel the registration of the club’s CEO Justin Pascoe," the statement said. "Like Mr Flanagan although the findings are preliminary, he will not be permitted to act in an official capacity with the club pending a final determination. "There is no suggestion that Farah has done anything wrong but the NRL believes the club should have disclosed the agreement. "The club and Mr Pascoe will have until the end of January to respond to the preliminary findings that have been made against them." In a statement, the Tigers said they were "shocked with the decision and extremely disappointed in the process" and would be "vigorously defending" the matter.